Poor play in overtime has cost the Avalanche points in the second half of the year, and the trend continued against Anaheim. 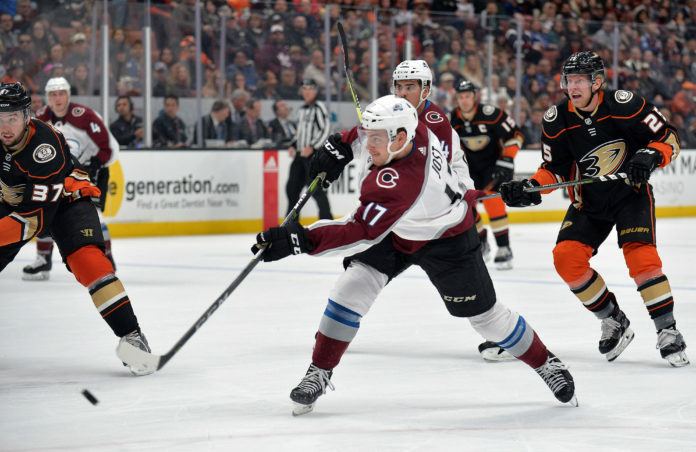 Up two goals heading into the third period, the Avalanche blew the lead and eventually lost in overtime to the team they’re chasing, the Anaheim Ducks, by a score of 4-3. The point from the overtime loss puts them back into a playoff spot, but the loss of the extra point could loom large down the stretch. A fortuitous bounce got the Avs on the board early. Alexander Kerfoot would eventually be named the goal scorer on one of the flukiest goals you will ever see, as the Ducks cleanly won a faceoff but the puck bounced off their own player’s foot and into the net. The lead would not last very long, however, as a turnover at the offensive blueline led to a breakdown and Andrew Cogliano would beat Jonathan Bernier on a breakaway to tie the game. The two goals in the first period would not be the only fireworks, as it was a feisty period in general. The key point in the period came when Ryan Kesler would cross-check Gabriel Landeskog into his own goaltender, which of course led to a melee. While John Gibson would stay in net the rest of the period, he would not return after the first intermission. The Avalanche would take advantage of a cold goaltender early. On a power play, Tyson Jost wiggled free in the slot and put a rebound past Ryan Miller to give the Avs a lead. From there, he was just getting started. After stealing a puck in the defensive zone with about eight minutes to go in the period, Jost would execute a give-and-go with Kerfoot and find himself all alone on Miller. He wasted no time and beat Miller over the glove in what was likely his prettiest goal of the year. Unfortunately, from there, it would be all downhill for the Avs. Heading into the third period with a two-goal lead, the Avalanche would keep Anaheim’s offense to the outside early on, but a lost faceoff kicked off a tough stretch for the team. Adam Henrique beat Carl Soderberg on the draw and just seconds later he would escape Soderberg’s defensive coverage to cut the lead to one. Just a minute and a half later, an innocent shot from the corner was kicked out into the slot by Jonathan Bernier, where Ryan Kesler was waiting to tie the game up. Although the Avs would come close a few times later in the third, they were unable to finish the game in regulation, and the two teams would head to overtime. Overtime, unfortunately, would be more of the same for the Avalanche. While they started the period with possession, they were never able to get a clear scoring chance, and from there it was all Anaheim. An odd man rush by the Ducks found Ondrej Kase with the puck, and he would dance around Samuel Girard only to beat Jonathan Bernier over the blocker to finish the game. The Ducks completed the comeback and extended their point lead over the Avalanche, while the overtime loss put the Avalanche back in front of St. Louis by a point. The Avalanche will have no time to rest, as they head to Los Angeles tomorrow evening to take on a rested Kings team. The Avs have struggled in recent years in LA and are looking to avenge a 7-1 defeat from the Kings a week ago. The game starts at 8:30 PM MST. The Avs top line chose a tough time to slow down offensively at even strength, and they struggled significantly in this game with poor puck decisions. Mikko Rantanen, in particular, may have played his worst game in an Avs uniform, and looked a little flustered by the physical play. Faceoffs continue to be a sore point for the Avalanche, as they lost 62 percent of the faceoffs in this game and a key one just before the Ducks second goal. Jonathan Bernier returned for his first full game since February 11, and played well, for the most part. He will be back in net for the game tomorrow night. J.T. Compher in particular got beat down badly in the faceoff circle, losing 12 of the 14 he took. The fourth line spent a lot of time in their own end. The only Avalanche players to finish with positive possession numbers were Mark Alt, David Warsofsky, and Carl Soderberg.